John Lennon formed a skiffle band called the ‘Quarrymen’. He was influenced by Elvis Presley’s success and wanted to become as famous as Elvis. The Quarrymen entered a TV Star Search competition. John Lennon met Paul McCartney at a church fete where his band was playing a set of music. He invited McCartney to join his band. The Quarrymen first played at the Cavern Club in Liverpool. Paul McCartney first played with the Quarrymen. Paul McCartney introduced 14 year old George Harrison to John Lennon. However, John felt that he was too young to join the group. Having persistently requested to join the group, George Harrison joined the band as lead guitarist. The Quarrymen recorded ‘In Spite of all the Danger, That’ll be the Day’. John’s friend, Stuart Sutcliffe, joined the band playing bass guitar. The ‘Quarrymen’ changed their name to ‘Beatals’. The name was chosen to honour Buddy Holly and the Crickets. The ‘Beatals’ changed their name to the ‘Silver Beetles’. The ‘Silver Beetles’ changed their name to ‘Silver Beatles’. Pete Best, a drummer, was asked to join the band. The ‘Silver Beetles’ changed their name to ‘The Beatles’. The Beatles began a 46 night spot at the Indra Club, Hamburg. The group began a 58 night spot at the Kaiserkeller, Hamburg. George Harrison was deported from Germany after authorities discovered he was under 18 years. Paul McCartney and Pete Best were deported from Germany after being arrested on suspicion of arson. Stuart Sutcliffe left the group to focus on art, Paul McCartney took over as bass guitarist. The Beatles began a three month spot at the Top Ten Club in Hamburg. The Beatles were backing musicians for Tony Sheridan’s ‘My Bonnie’ and ‘The Saints’. Brian Epstein watched ‘The Beatles’ performing at the Cavern Club. The Beatles auditioned for Decca Records but were unsuccessful. The group signed a 5-year management contract with Brian Epstein. Former Beatle, Stuart Sutcliffe, died of a brain haemorrhage. The Beatles began a 48 night spot at the Star-Club, Hamburg. George Martin of Parlophone, EMI offered the Beatles a recording contract on condition that they replace drummer Pete Best. John Lennon married Cynthia Powell at Mount Pleasant Register Office, Liverpool. Cynthia had to keep a low profile because they did not want fans to know that John was married. Richard Starkey (Ringo Starr), drummer with the band Rory Storm and the Hurricanes, replaced Pete Best as drummer of the group. The Beatles signed a new management contract with Brian Epstein, needed because of Ringo Starr replacing Pete Best. Under the contract Epstein recieved 25% of the group’s earnings. ‘The Beatles’ released their first single ‘Love Me Do’. The single reached number 17 in the British charts. The Beatles began a 14 night spot at the Star-Club, Hamburg. 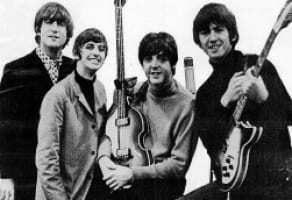 The group recorded the single ‘Please Please Me’. The Beatles began a 13 night spot at the Star-Club, Hamburg. The single ‘Please Please Me’ was released in the UK. The Beatles recorded the album ‘Please Please Me’. The single ‘Please Please Me’ reached No 1 in the UK. The album ‘Please Please Me’ was released in the UK. It reached No 1 in the album charts. The single ‘Please Please Me’ written by Lennon and McCartney was released in the UK. It was the group’s first no 1 hit in the UK. The Beatles went on tour supporting Roy Orbison. The single ‘Please Please Me’ written by Lennon and McCartney was released in the US. It did not do well. The album ‘Please Please Me’ was released in the US under the title ‘Introducing The Beatles’. It was a flop. The EP ‘Twist and Shout’ was released in the UK. It reached number 1 in the charts. The single ‘She Loves You’ written by Lennon and McCartney was released in the UK. It was the fastest selling single at the time quickly reaching no 1 and remains the group’s best selling single. The single ‘She Loves You’ written by Lennon and McCartney was released in the US. It had little impact. The Beatles popularity continued to spread across Europe and the term Beatlemania was coined. The group performed on the UK TV Show ‘Sunday Night at the London Palladium’. The Beatles recorded ‘I Want To Hold Your Hand’. The group made a 7 day tour of Sweden. The Beatles performed in front of Queen Elizabeth II, Princess Margaret and Lord Snowdon at the Royal Command Performance. The album ‘With the Beatles’ was released in the UK. It reached No 1 in album charts. The Beatles released ‘I Want To Hold Your Hand’ written by Lennon and McCartney in the UK. It reached No 1 in the charts and was the second album ever to sell a million copies (the first was the South Pacific soundtrack in 1958). The Beatles released ‘I Want To Hold Your Hand’ in the US. It was their first hit in America reaching no 1. The group began a series of concerts at L’Olympia, Paris. The Beatles released the album ‘Meet the Beatles’ in the US. It reached No 1 in the charts. The Beatles recorded ‘Can’t Buy Me Love’. The Beatles released ‘All My Loving’ in the UK. The group left London Heathrow to fly to New York. Around 4,000 screaming fans were at Heathrow to see them off and around 3,000 American fans welcomed them to JFK airport. The Beatles appeared on the Ed Sullivan Show in the United States. They performed 5 songs to an audience of more than 73 million people. The group performed at the Washington Coliseum. The Beatles performed at Carnegie Hall in New York. The group were involved in filming for ‘A Hard Day’s Night’. The single ‘Twist and Shout’ was released in the US. The single ‘Can’t Buy Me Love’ was released in the US. The single ‘Can’t Buy Me Love’ was released in the UK. John published a collection of poems and nonsensical writings entitled ‘In His Own Write’. The Beatles began a Tour tour which included dates in Denmark, Netherlands, Hong Kong, Australia and New Zealand. The Beatles released ‘Long Tall Sally’ in the UK. It reached number 1 in the charts. The group released the soundtrack to the film ‘A Hard Day’s Night’ in the US. It went to No 1 in the album charts. The Beatles film ‘A Hard Day’s Night’ premiered in London, UK. The Beatles released the soundtrack to the film ‘A Hard Day’s Night’ in the UK. It went to No 1 in the album charts. The Beatles film ‘A Hard Day’s Night’ was released in the US. The group began a tour of America. They controversially refused to play to at any venue where blacks and whites were segregated. The Beatles met Bob Dylan who introduced them to marijuana. The Beatles recorded their album ‘Beatles for Sale’. The group received five Ivor Novello awards. The single ‘I Feel Fine’ was released in the US. The single ‘I Feel Fine’ was released in the UK. The album ‘Beatles for Sale’ was released in the UK and went straight to No 1 in the charts. The group began filming their second movie ‘Help!’. John and George experienced LSD for the first time after their coffee was spiked with the drug by George’s dentist. The single ‘Ticket To Ride’ was released. John, Paul McCartney, Ringo Starr and George Harrison were awarded the MBE. Paul McCartney recorded ‘Yesterday’. It was the first recording by a single member of the group. John published a second collection of poems and nonsensical writings entitled ‘A Spaniard in the Works’. The single ‘Help’ written mainly by John Lennon was released in the US. The single ‘Help’ written mainly by John Lennon was released in the UK. It reached number 1 in the charts. The film ‘Help’ premiered in London. The soundtrack to the film ‘Help’ was released in the UK. It reached number 1 in the charts. The film ‘Help’ was released in the US. It reached number 1 in the charts. The soundtrack to the film ‘Help’ was released in the US. It reached number 1 in the charts. The Beatles performed at the Shea Stadium in New York in front of an audience of 55,600. They were concerned that their music was not being heard over the screaming of fans. The single ‘Yesterday’ was released in the US. The single ‘Yesterday’ was released in the UK. The Beatles released the album ‘Rubber Soul’ in the UK. It went straight to No 1 in the charts. The single ‘Day Tripper’ was released. The Beatles released the album ‘Rubber Soul’ in the US. It went straight to No 1 in the charts. John met Yoko Ono either at an art exhibition or when she requested some music from John. John controversially commented that ‘we’re more popular than Jesus now’. This caused demonstrations against the group in religious areas of America. The group began recording the album ‘Revolver’. The single Paperback Writer written by Lennon and McCartney was released in the US. It went straight to number 1 in the charts. The single Paperback Writer written by Lennon and McCartney was released in the UK. It went straight to number 1 in the charts. The compilation album ‘Yesterday and Today’ was released in the US by Capitol Records. The album initially caused controversy because the cover featured the Beatles in butchers aprons surrounded by mutilated dolls and raw meat. Capitol records hastily replaced the covers. The group toured Japan and the Philippines. They were accused of snubbing the presedential family in the Philippines. The Beatles’ single ‘Eleanor Rigby/Yellow Submarine’ was released. The album ‘Revolver’ was released in the UK. It went straight to No 1. The album ‘Revolver’ was released in the US. It reached number 1 in the charts. The Beatles returned to America for another tour. The group performed their last live concert at San Francisco’s Candlestick Park. John met Yoko Ono at the Indica Gallery. The group began work on ‘Sgt Pepper’s Lonely Hearts Club Band’. The Beatles released ‘Strawberry Fields Forever”/”Penny Lane” a double A side single in the UK and the US. It reached number 2 in the UK and number 8 in the US. Paul met photographer, Linda Eastman. The Beatles released the album ‘Sgt Pepper’s Lonely Hearts Club Band’ in the UK. It went straight to number 1 in the charts. The Beatles released the album ‘Sgt Pepper’s Lonely Hearts Club Band’ in the US. It reached number 1 in the charts. The group performed ‘All You Need is Love’ on ‘Our World’ the World’s first global TV link. It was viewed by an audience of 350 million. The Beatles released the single ‘All You Need is Love’ written by John Lennon in the UK. The Beatles released the single ‘All You Need is Love’ written by John Lennon in the US. The Beatles’ manager, Brian Epstein died of an accidental overdose of sleeping tablets. The group were told of his death while attending a seminar on Transcendental Meditation by the Maharishi Mahesh Yogi. The group released the single ‘Hello, Goodbye’ in the UK. The group released the film ‘Magical Mystery Tour’. The film itself did not do well but the movie soundtrack did well. The Beatles founded Apple Corps, a corporation that included Apple Records and other companies. John, Paul, George and Ringo went to India for two months to study with the Maharishi Mahesh Yogi. The group released the single ‘Lady Madonna’ in the UK. The group released the single ‘Lady Madonna’ in the US. The movie ‘Yellow Submarine’ premiered in London. The Beatles released the single ‘Hey Jude’ in the US. The Beatles released the single ‘Hey Jude’ in the UK. The ‘White Album’ also known as ‘The Beatles’ was released in the UK. It reached number 1 in the charts. The ‘White Album’ also known as ‘The Beatles’ was released in the US. The album ‘Yellow Submarine’ was released in the US. It reached No 2 in the charts, second to ‘The White Album’. The album ‘Yellow Submarine’ was released in the UK. The group performed an impromptu rooftop concert from the roof of Apple Corps Ltd in London. It was the last time they performed together. Paul McCartney married Linda Eastman. John married Yoko Ono in Gibraltar. They spent their honeymoon in bed at the presidential suite of the Amsterdam Hilton as a peace protest. The Beatles released the single ‘Get Back’ in the UK. The Beatles released the single ‘Get Back’ in the US. Allen Klein was appointed manager of the band despite the objections of Paul McCartney who wanted his father and brother-in-law to have the job. The group began recording the album Abbey Road. John left the group but the news was kept secret. The Beatles released the album ‘Abbey Road’ in the UK. It was the Beatles last studio album and reached No 1 in the charts. The group released the album ‘Abbey Road’ in the US. The single ‘Something/Come Together’ was released. Paul McCartney announced that he had left the group. The Beatles released their final single ‘Let It Be’ in the UK. The Beatles released their final single ‘Let It Be’ in the US. Paul McCartney announced that the Beatles had split. The album ‘Let It Be’ was released. Paul McCartney filed for a legal dissolution of the Beatles’ partnership. The Red Album also titled 1962 – 1966, a compilation of hits from those years was released. It reached number 3 in the UK and number 1 in the US. The Blue Album also titled 1967 – 1970, a compilation of hits from those years was released. The Beatles partnership was officially dissolved. The compilation album ‘Rock n Roll Music’ was released in the US. The compilation album ‘Rock n Roll Music’ was released in the UK. The album ‘Live! at the Star-Club in Hamburg, Germany, 1962’ a compilation of live music from performances at the club in December 1962 was released. The compilation album ‘Love Songs’ was released in the US. The compilation album ‘Love Songs’ was released in the UK. ‘The Beatles Collection’ a Box set of Beatles albums was released in the US. It was limited to 3000 copies. ‘Rarities’ a Box set of lesser known Beatles songs was released in the UK. ‘The Beatles Collection’ a Box set of Beatles albums was released in the UK. There was no limit on the number of copies. ‘The Beatles Ballads’ a compilation of ballad songs was released. ‘The Beatles Box’ a set of eight albums was released. John Lennon was assassinated by Mark Chapman. ‘The EP Collection’ a box set of EPs was released. ‘Reel Music’ a compilation of music from Beatles’ films was released. ‘The Beatles Collection’ a set of all 14 Beatles albums remastered was released. ‘The Beatles Mono Collection’ a box set of all Beatles albums that were originally issued as mono LPs in the UK. ’20 Greatest Hits’ a compilation of songs that reached number 1 in the UK was released in the US. ‘Past Masters’ a two disc compilation of songs was released. ‘The Beatles Box Set’ a collection of 16 albums containing the entire works of the Beatles from 1962 – 1970 was released. ‘Live at the BBC’ a compilation of songs broadcast by BBC radio from 1963 – 1965 was released. ‘Anthology 1’ a compilation of music was released. ‘Anthology 2’ a compilation of music was released. ‘Anthology 3’ a compilation of music was released. ‘Yellow Submarine Songtrack’ a remix of the original film soundtrack was released to coincide with the re-release of the film. ‘1’ a compilation of songs that reached number one in the UK and the US was released on the 30th anniversary of the band’s split. ‘Let It Be ..Naked’ an alternative version of the 1970 album ‘Let It Be’ was released. ‘The Capitol Albums Vol 1’ a compilation of releases by Capitol Records in 1964 was released. ‘The Capitol Albums Vol 2’ a compilation of releases by Capitol Records in 1965 was released. ‘Love’ a compilation of remixed music for the Cirque du Soleil show, Love was released. ‘The Beatles (The Original Studio Recordings)’ a box set of all remastered recordings by the Beatles was released. ‘The Beatles in Mono’ a remastered release of ‘The Beatles Mono Collection’ (1982) was released on CD. ‘Tomorrow Never Knows’ a compilation of songs by the Beatles was released on iTunes. ‘On Air – Live at the BBC Volume 2’ a live/compilation of 40 previously unreleased tracks from BBC Radio broadcasts was released. ‘The Beatles Bootleg Recordings 1963’ a compilation of 59 unreleased recordings was released on iTunes. ‘The US Albums’ a box set compilation of remastered American albums released between 1964 and 1970 was released in the US. ‘The Japan Box’ a box set of the five albums released in Japan between 1964 and 1965 was released. ‘1+’ a remixed version of the album 1 (2000) was released. ‘Live at the Holywood Bowl’ a remixed and remastered version of the 1977 album was released. ‘The Beatles Sgt Pepper’s Lonely Hearts Club’ was re-released to commemorate the albums 50th anniversary.